Long Iron Condor is one of the sideway strategies employed in a low volatile stock. It is usually a four-legged spread option strategy using a combination of both puts and calls options with the same expiration date but different strike prices. Typically the strike prices between the various options are equal distance for this strategy. 1 Short Strangle (Short slightly OTM puts and calls) + 1 Wider Long Strangle (Long OTM puts and calls). You are expecting a drop in volatility or no movement from the underlying stock. Limited to the Net Premium Collected when the underlying stock is trading between the two middle strike price at expiration date. Downside Breakeven = Middle Short Put Strike less Net Premium Collected. This is typically a net credit trade as you are combining two credit spreads: Bull Put Spread and Bear Call Spread at the same time. The biggest advantages from Long Iron Condor is the opportunity to collect double (or near double) premium from a stock that is contracting in volatility. Limited risk exposure when the underlying stock moved beyond the breakeven point on expiration date. The limited profit potential only come from the trading range between the 2 wing strikes. Bid/Ask spread from the various option legs may adversely affect the profit potential of the strategy. Risk on both direction. Dramatic advance or decline of the underlying stock will greatly increase the value of the call or put side. This may only be partially offset by the other side of the trade. Offset the position by buying back the options that you sold and selling the options that you have bought in the first place. Remembering that Long Iron Condor is a combination of other strategies, you can also unravel the spread in two legs. In this way, advance traders can create bullish, bearish, sideway or volatility strategies based on the underlying stock’s movement. Assumption: XYZ is trading at $137.60 a share on Mar 20X1. You are expecting share price of XYZ to fluctuate back and forth within a strong support and resistance price level. You would like to profit from the low volatility of this stock with no capital outlay and limited risk exposure. In this case, you may consider to buy one Apr 20X1 $130 strike put at $1.10, sell one Apr 20X1 $135 strike put at $2.40, sell one Apr 20X1 $140 strike call at $2.50 and buy one Apr 20X1 $145 strike call at $1.00 to profit from the low volatility outlook of the stock. Note: commissions are NOT taken into account in the calculation. = Limited to the different in adjacent strikes less net premium collected. 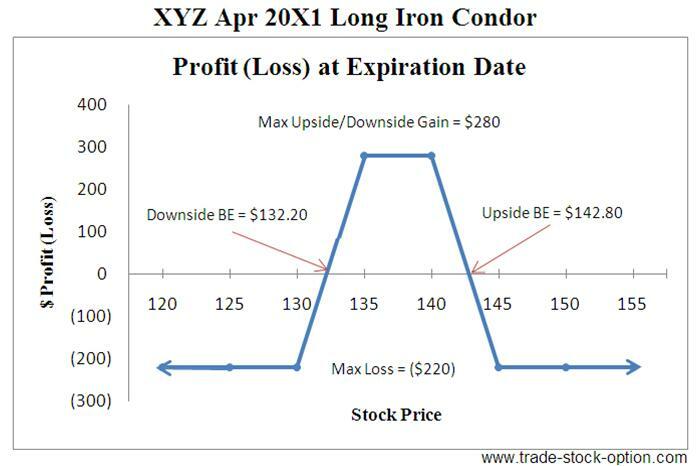 A Long Iron Condor is a strategy whereby you combine two income strategies Bull Put Spread and Bear Call Spread to profit from a trading range or volatility contraction, or to take advantage of time decay. It is a four –legged spread option strategy consisting of puts and calls options and is the opposite of Short Iron Condor, which is a volatility strategy. Typically the strike prices between the options legs are equal. However in this strategy, you do not need to space them equally apart. You can weight more toward calls versus puts, or vice versa, by tailoring the position according to your view of the underlying stock and the risk-reward parameters. The two long options at the outside strike ensure that the risk is limited on both sides. This is also a much more conservative strategy than the Short Strangle and profit area is wider than Long Iron Butterfly. This is a strategy whereby you profit when the underlying stock fluctuates back and forth within a trading range and it allow the premium from the puts and calls credit spread to be earned due to time decay. Try to ensure that the stock is trading range bound and identify clear areas of strong support and resistance. The stock is also anticipated to consolidate (become less volatile) and trading sideway for the duration of your trade. Time decay is generally helpful in this strategy when it is profitable and harmful when it is in a loss position. When you enter the trade, the stock price will typically be in the profitable area of the risk profile. Therefore it is preferably to use this option trading strategy with around 1 month left to expiration so as to give yourself less time to be wrong. As to whether a long condor strategy should be executed using all calls, all put options or a combination of puts and calls options depend largely on the relative price of the option. The premium of both puts and calls option should be taken into consideration to achieve the optimum trade. An Iron Condor strategy is a good strategy to deploy in your arsenal of trading strategies. You should pick the strike price and time frame of the Long Iron Condor according to your risk/reward tolerance and forecast outlook of the underlying stock. Having the patient to wait, knowledge to apply and discipline to follow through the option trading strategies with appropriate risk-reward parameters is important to your long term success in option trading.